This rubric is great to use for general poster projects. There is a section of the rubric that addresses quality of the poster and a section that addresses quality of the presentation. 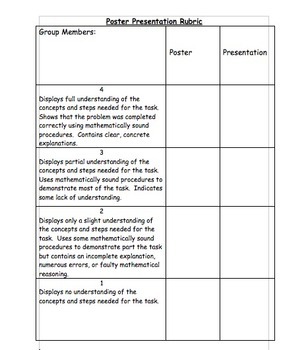 This rubric can be applied for group work or individual work. The rubric uses student friendly and mathematical language. If you are not a math teacher, the document is fully editable to incorporate topic-appropriate language.